This month, Elizabeth asked the Bread Baking Babes to make Broa, a Portuguese yeasted corn bread. 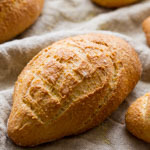 In addition to being a terrific, dense, moist bread with a hearty corn flavor, this was a perfect bread for me this month because I was trying, in preparation for my move, not to buy any new ingredients, and I actually had some white cornmeal on hand. The only significant change I made to Elizabeth’s wonderful recipe was to bake the bread longer. After the designated 30 minutes, the bread was just too pale for me, so I baked it an additional 10 minutes at full heat, and then turned the oven off and left the door ajar for another 10, to take the crust to golden-brown perfection. Now I’m running a little late — I was supposed to have posted this yesterday. And if I had, I would have told you about the day also being World Bread Day, hosted by Zorra. And yesterday was also World Food Day, when the United Nations’ Food and Agriculture Organization focuses attention on global food security issues. It’s not really too late to tell you that, is it? Food security is as much of an issue today as it was yesterday. Please get involved in whatever way you can. I’m so impressed that you took the time from packing up for your moving to make the bread, Susan. And of course, your bread looks perfect. I’m glad I put a note in the recipe about the final internal temperature. Isn’t it interesting how different ovens cause different baking times. And who knows what temperature our ancient electric oven really is when it’s set to 400F? And definitely, it’s not to late to mention World Food Day. I maintain that every day should be World Food Day. 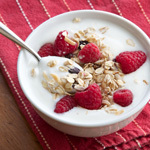 Susan, thanks for posting these interesting recipes. Your results always look so yummy. Besides being a great hands-on teacher, your confidence and enthusiasm inspires me. 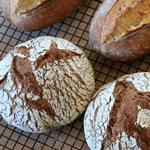 We are all interested in knowing how you designed your new kitchen for optimal bread baking. Beautiful and quite tempting bread. And, good luck with the move Susan. Lovely! Great colour. I am learning from you not to be afraid to give the bread time in the oven. Glad your move was a safe one, I’m looking forward to kitchen pics too! So right, the extra time yielded a great color to the crust. Love the crumb you got, too. Looks yummy. Looks terrific as usual Susan. Makes me want to go out and buy some corn flour. As soon as I saw the title Broa on a link in Bakers Royale blog I couldn’t resist checking it out. 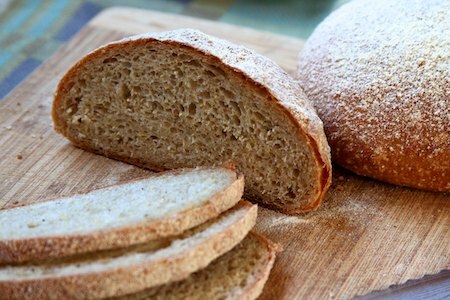 My late grandmother use to make Broa every week, large quantities in order to last the week in a wood burning oven that was the traditional way of baking bread, and in most farmhouses the only oven they had. The door of the wood oven was sealed with cow manure mixed with hay. It’s an imagine which I will never forget. 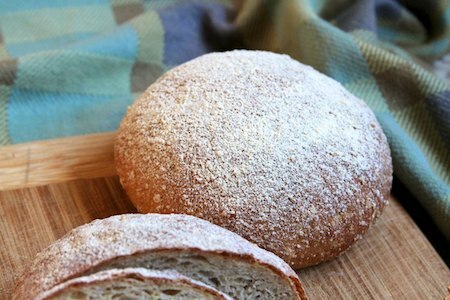 I so wished I had asked her for the recipe, never thought I would be so into bread making as I am now. Her Broa was golden yellow, made from the corn she grew in her land, and once baked and cooled wrapped in the linen clothes made by her and her mother, with linen also grown on her land too….talk about from hand to mouth! 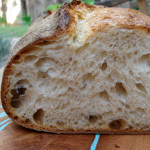 You’ve got a lovely open texture on the crumb and knowing from eating broa it will be lovely and moist. My gran’s bread had large cracks all over the crust, maybe from the heat of the wood oven, it had dense crumb, heavy but tasty. Yours looks lighter, very appetising. Oh and I forgot to add, my grandmother’s recipe used a sourdough leave of some kind not dried yeast, because my father remembers her feeding the leaven….now I really wished I had asked for the recipe! How did you manage it all, moving, baking, posting… they wouldn’t go well together when I was the one to do it. Wonderful bread (as always! ), I baked mine a lot longer too! As a portuguese it always makes me happy to see references to our food culture on international websites. Unfortunately, I don’t think we were so sucessful at exporting our food culture as spanish or italians. Oh well, maybe one day. I’ve made about three batches of this bread now. It’s fantastic! I can’t stop eating it. It’s also given me an opportunity to brush up on my batard shaping skills. My first four loaves didn’t get the greatest rise, but the next two did. I think it was the shaping, but it may have also been my starter. Anyway, they look much better now. The only thing I am finding challenging is slashing through those seeds and getting really nice cuts. This one is going to become a standard in my bread baking rotation. 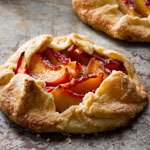 Thank you for the link to this wonderful recipe. 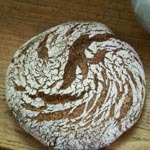 I’ve been craving broa ever since buying a loaf at the open air market outside the walls of Evora, Portugal years ago. 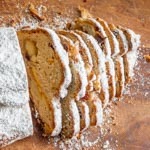 The Evora loaf looked like the loaf in Elizabeth’s recipe rather than the loaf in the picture linked in Paolo’s post. And the result, in the loaf I made and if memory serves, tastes like the Evora loaf. A sample of one, but what a sample! Hey, I just came across your post. I had a couple of notes, mainly to do with what percentage of flours you used. 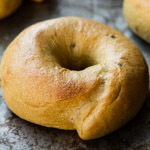 Broa, at least in Portugal, never has an open airy texture like yours, and the cracks that Azelia mentioned are the traditional sign of a good broa. 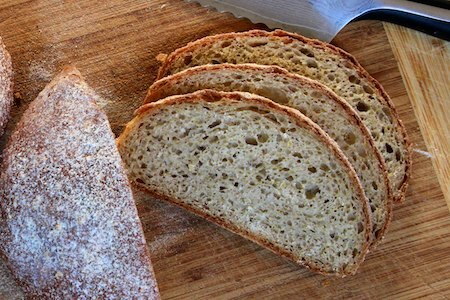 Most bakeries nowadays use a mixture of cornmeal and wheat flour because it makes the dough easier to work with, however, the traditional method calls for simply cornmeal and rye flour so you end up with a golden yellow crust that’s crumbly and quite dense as well as a very heavy crust.